As the owner of a pretty tricked out 2008 Kawasaki Teryx, I am very familiar with the Teryx. My Teryx did not stay stock long, but I recently spent three days in a bone stock 2008 Teryx on a ride to the Grand Canyon. The 2008 Teryx is a great machine, but my biggest complaint was that it came out with carbs instead of fuel injection. In less that a year since the first Teryxs hit dealer floors, Kawasaki dealers are already selling 2009 Teryxs with EFI. The New digital fuel inject on the Teryx is really nice. The engine starts right up and idles smoothly. On acceleration, the 2009 Teryx felt more crisp and seemed to get up to top speed a little quicker. While it is not a night and day difference, I definitely preferred everything about the EFI on the 2009 over the carburetors on the 2008. Next up on the list of what's new is a fuel gauge. I know it doesn't seem like something to get that excited about, but I do some long distance rides, and the fuel level display takes the mystery out of "I wonder how much fuel I have left?" The Teryx Sport has upgraded aluminum wheels which not only look much better, but are also 2.2 lbs. lighter than the standard steel wheels. Losing unsprung weight not only requires less energy to get the tires spinning, but also helps the suspension work better. And as a little bonus, the aluminum wheels are actually strong that their steel counterpart. Suspension is on the 2009 Teryx Sport has a few upgrades as well. The gas-charged Kayaba shocks have reservoirs all the way around to help reduce fade in rough terrain. The preload adjustment is step-less, and they have fully adjustable rebound and compression (high and low speed) damping. Although we did not have any opportunities to jump the new Teryx Sport, we did get into some nasty whoops and hard g-outs. I felt the Teryx Sport suspension handled the terrain better than a standard Teryx suspension. The ride through the light chop was a bit smoother than a standard Teryx and when we got into the whoops I felt a little more comfortable as well. Although I was able to bottom out the front shocks on a few hard g-outs, a standard shock would have gone to the stops more often and with more force. Overall, even though I did not spend any time trying to fine tune the adjustments on the new Sport shocks, I think they are a worthy improvement over standard shocks. The Lime Green plastic on the Teryx Sport is a great color. Much more sharp than the drab green found on the 2008 Teryx. 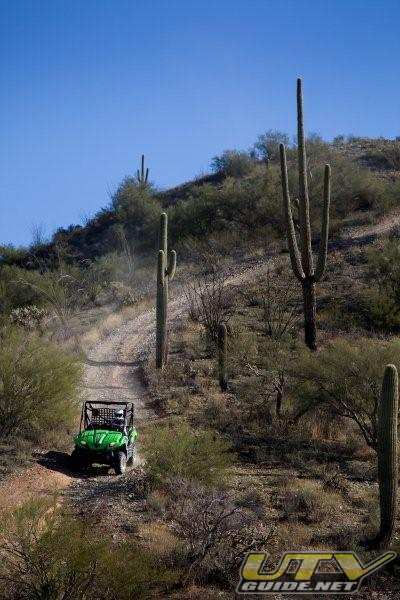 And with all the UTVs out in the dunes in Glamis, there is no doubt that you are in a Kawasaki when you are driving it. 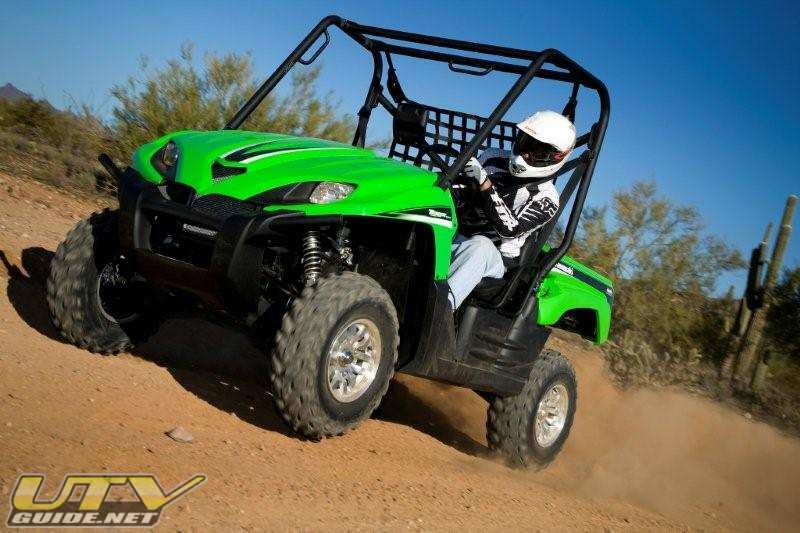 The 2009 Kawasaki Teryx 750 FI 4x4 Sport has a MSRP of $11,899. A full list of all new 2009 Kawasaki Teryx improvements and photo galleries can be found here.